OLD PARKED CARS. : 1988 Subaru Justy RS. Sweeeeet, another Justy! Love these little shits. 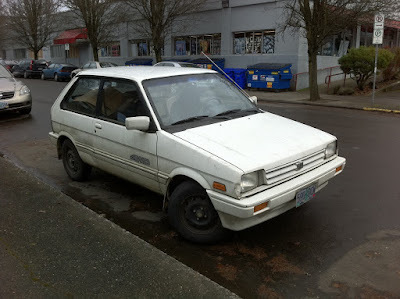 My sister had an '89 (the facelifted version, slightly rounder than this). It was a DL, totally basic spec, no air-con, no power anything, with that ridiculous "SHIFT ^" light in lieu of a tach. 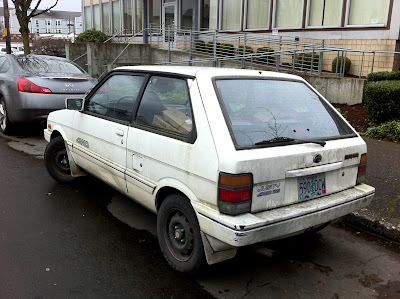 It was a great car for commuting, something like 40 mpg, even if it did rattle like a washtub over big bumps. Unfortunately, it spent its last days locked in a garage with head-gasket problems before being donated to a charity. I had one very similair to this one. 5 speed with the 4wd button on the shifter. Had so much fun in that car and it never broke down on me. gutless, but the 4wd made up for it. 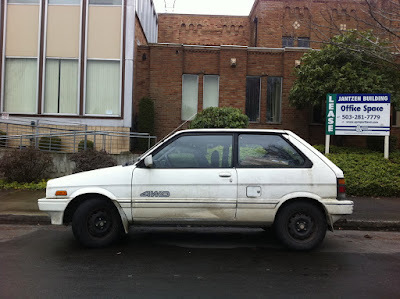 This was my first new car. White Justy RS. 12" wheels. Believe it or not a buddy of mine and our girl friends (4 of us) made a college road trip from VT to FL and back in this thing. At 75mph the 3 cyl was at about 4000rpms. Loved the OnDemand 4WD. It was so light it basically went wherever you pointed it. Good times. I remember I picked it up on a cold January day in VT and of course the dealership washed it. I was driving out in a remote part of the state and stopped for gas but the lock on the gas cap was frozen solid and I had to force it open.